How does one manage vegetarianism in Korea without knowing the language? Being a plant-based eater doesn’t exactly help as Koreans have an increasing appetite for meat dishes while fish has always been part of their staple diet. But, of course, with some good will, hand gestures and a few basic tricks you will quickly learn not just how to survive but, even better, to indulge in Korea’s culinary delights, some of which are based on surprisingly simple ingredients. Kim, or gim means “seaweed,” and kimbap are Korean seaweed rice rolls. It’s the Korean version of the generally better known Japanese sushi. 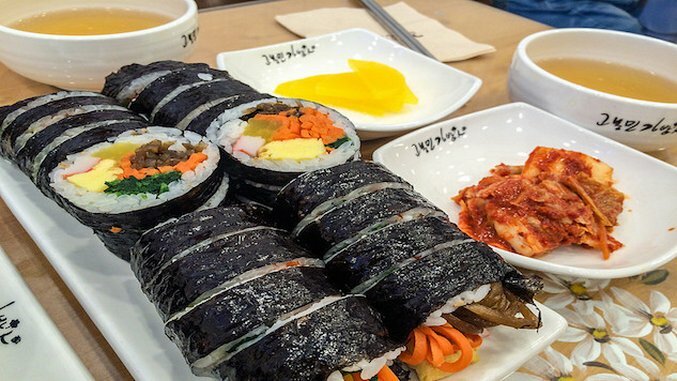 Kimbap restaurants offer a list of varieties, including for take-out, but the basic and cheapest one, on top of the menu list, generally includes yellow pickled radish, egg, spinach, sliced carrot and ham. Sometimes a slice of surimi is added or comes instead of the ham. So while not a vegetarian dish in itself, it is easy to order as such, as well as in a vegan version. So how do you ask for a vegetarian/vegan version? - Ask for yatze kimbap — yatze, or yachae means vegetables. Remember the bap? Here’s another steamed rice dish. Bibim means “mixed,” warranting a mixed steamed rice dish. You’ll get a bowl with colorfully displayed vegetables and mushrooms topped with a fried egg and a stainless steel bowl with hot rice and a side dish with gochujang, a thick, deep-red chili paste. On the table you’ll find an additional array of side dishes, most of them vegetables and mushrooms. Tofu, meat and/or fish dishes may be part of them as well. You mix the rice with the contents of your bowl, adding as much spicy sauce as you like, and eat it with your spoon (in Korea rice is eaten with a spoon), while nibbling from the side dishes with your chop sticks. Is a side dish empty and you’d like more? Just ask for a refill — it’s included in the price. - Gyeran means egg, and to ask to leave out the egg you can say, “Gyeran pe djuseo” (pe means “no,” and djuseo means “please” — no egg please). - Or say “Gyeran mot mogoyo” (“egg can’t eat”). Jeongsik, also called baekban jeongsik, is Korea’s set meal. A fixed price which gives you a bowl of steamed rice and a number of side dishes (banchan), a perfect way to try a variety of Korean food. If you finish a dish (or your rice), you can ask for more. Jeongsik is a dish that you will eat with at least two people, otherwise it can never be profitable for the restaurants. The price is based on the type and number of side dishes — the expensive version is called han-jeongsik. The dishes will include a variety of leafy greens, mushrooms, seasoned seaweed, kimchi, vegetable pancakes and pickles as well as fish or meat. I have found, thus far, that most of the dishes are vegetarian, but, of course, you can simply ask the waiter to omit the animal foods using the above-mentioned tips. Two handy words to memorize: memil is “buckwheat,” and guksu means “noodles” — these ingredients come in different combinations. Makguksu is a perfect summer meal. I have to add that the buckwheat noodles are cooked in broth, which may be based on meat or on vegetables. When I asked if the dish was vegetarian this was answered positively, but due to the language gap I have never been sure about the broth. Makguksu is served in ice-cold water with slices of cucumber and radish and with seaweed and sesame seeds. As vegetarian food isn’t that common in Korea, not all cooks may realize that broth based on meat does not fit into a vegetarian lifestyle, so this part may always be a bit of a gamble when it comes to dishes prepared in broths. If you don’t want to take a chance with this because of the broth but still would like to try a buckwheat dish, go for a memil jeon, a pancake prepared with a batter of buckwheat flour and water that comes with a filling of scallions and/or cabbage. Tofu is an excellent meat substitute and many Korean restaurants have tofu dishes on their menu. Dubu jorim, braised tofu, is a good option for spicy food enthusiasts. Slices of tofu are fried in oil until they are crisp and then braised in a mixture of soya sauce, garlic, onion, green onion, salt, hot pepper flakes, sugar and sesame seeds. The braised tofu is served with a number of banchan, just as with the aforementioned dishes. Tip: if you want other dishes with tofu, look for the characters for dubu, which means tofu.